How to make a CV when you want to change career? Changing your career can be a daunting time for most, but how to convey the change in your CV? IT can be a very simple thing to do if you can convey how your existing skills and experience would benefit you in the new career. The best way to do this is to utilise your personal statement. The example I am going to show you is for a Kennel Hand to change careers to work in Childcare. You would try and show correlation between aspects of animal care, and aspects of childcare, such as the importance of keeping to schedules, the importance of being able to communicate without clear English being spoken between two beings, the responsibility over another living thing etc. The idea is basically to show that although you have gained your skills in a different setting, they are clearly relevant to a number of other avenues. You should also use your covering letter to detail reasons for the career change and to encourage being given a chance. One advantage you must remember you have over someone who has already worked in the field you are applying to, is that you have the SKILLS, but have never applied them in the field, therefore you are very easy to train to the standard the employer would like, and this will go in your favour, as other candidates may be stuck in their ways having already carried the role out. 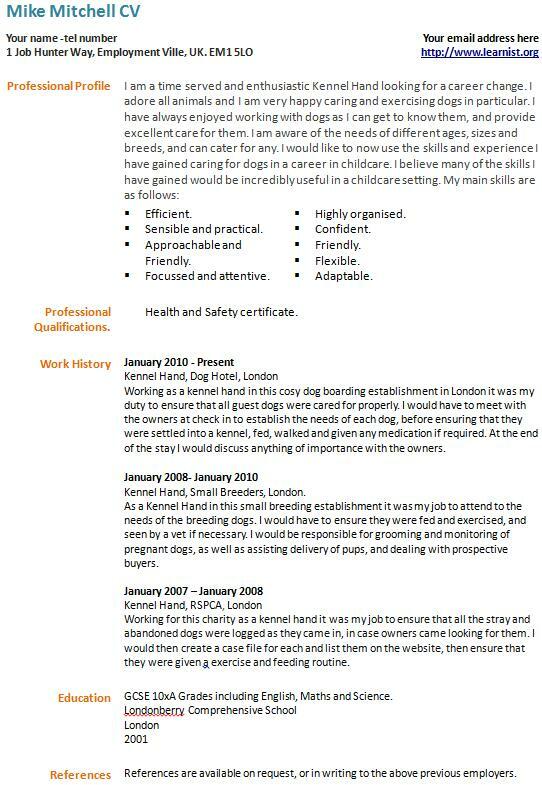 Working as a kennel hand in this cosy dog boarding establishment in London it was my duty to ensure that all guest dogs were cared for properly. I would have to meet with the owners at check in to establish the needs of each dog, before ensuring that they were settled into a kennel, fed, walked and given any medication if required. At the end of the stay I would discuss anything of importance with the owners. Kennel Hand, Small Breeders, London. As a Kennel Hand in this small breeding establishment it was my job to attend to the needs of the breeding dogs. I would have to ensure they were fed and exercised, and seen by a vet if necessary. I would be responsible for grooming and monitoring of pregnant dogs, as well as assisting delivery of pups, and dealing with prospective buyers. Working for this charity as a kennel hand it was my job to ensure that all the stray and abandoned dogs were logged as they came in, in case owners came looking for them. I would then create a case file for each and list them on the website, then ensure that they were given a exercise and feeding routine.